Moving the Forestry Industry Forward. Canada’s thriving forestry industry relies on hard work and heavy equipment. For over 160 years, Wajax has provided a wide variety of new and used logging equipment to support this vital Canadian industry. Our goal is to help you achieve the lowest cost per metre or board/ft. at the maximum amount of throughput. Wajax provides first class harvesting equipment, on the road log transportation support services, mill components, and lumber material handling solutions. From our Canada-wide team, to our partnerships with well-known brands like Hitachi, Tigercat, Hyster and Peterson, our offering to the Canadian forestry segment is unmatched. 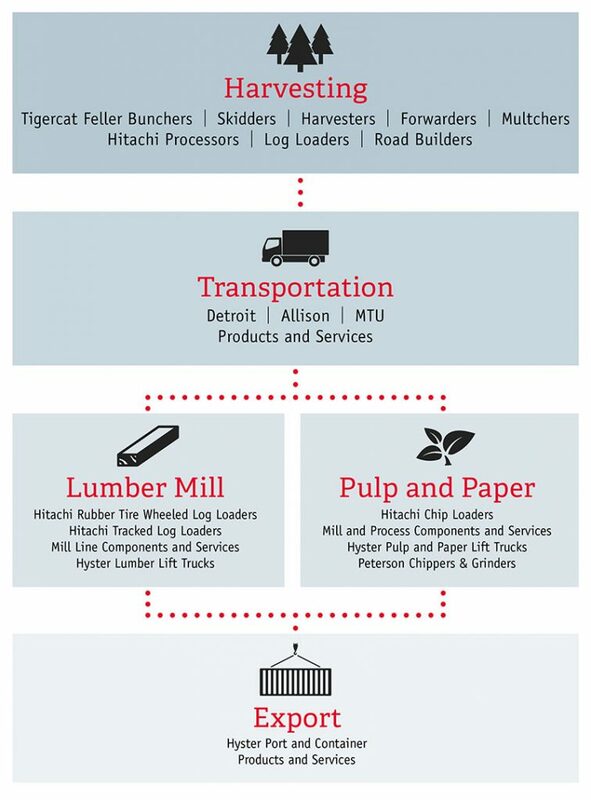 Wajax provides products and services that support each phase of the forestry chain, from cutting at the stump to the delivery of manufactured finished product. Supporting Canadian forestry begins with offering a massive selection of new and used equipment like processor attachments, feller bunchers, harvesters, mulchers and log loaders – but at Wajax, it doesn’t end there. Wajax proudly offers unique aftermarket service and maintenance options that can lower overall costs and enable more efficient management of your forestry equipment. Individualized local and national fleet management programs are available which can be customized specifically for your fleet – and these systems are backed by cutting-edge technology. Wajax utilizes OEM fleet management Telematics Systems to remotely connect owners and managers to their equipment. This system provides alerts and machine information, including location, engine hours, utilization, performance, and maintenance data to manage where and how forestry equipment is operating. Wajax proudly employs the most experienced, reliable and quality mechanics and technicians in the industry – and we have the warranty to show it. Within 6 months of services performed, Wajax guarantees the service labour on any brand of forestry machinery performed by Wajax mechanics and maintenance technicians.